Bells have been rung in Hartshorne Parish Church since at least 1580 (430 years) and we know that there were 4 bells in 1762 (250 years ago) when the 2nd, 3rd and 4th were installed. That means there would have been a weekly practice then and ever since – except for the relatively small periods when the bells were not in use. Actually the parish accounts strongly suggest multiple bells in 1629 so it could be 384 years since weekly practising started. 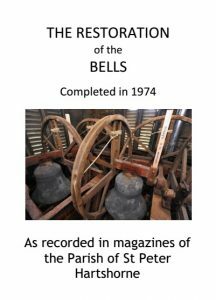 The restoration of the bells completed in 1974 is documented in the church magazines . 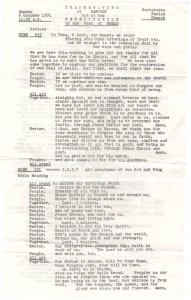 We have also found an Order of Service for the THANKSGIVING at HARVEST and the REDEDICATION of our PEAL of BELLS. You can find out more by clicking the pictures below. If you would like to know more about Bell Ringing at Hartshorne click here. Hartshorne Society of Bell Ringers have recently secured funding from Heritage Lottery Fund to carry out necessary repairs and renovations to the bells and tower. For more information on this check out their BLOG.